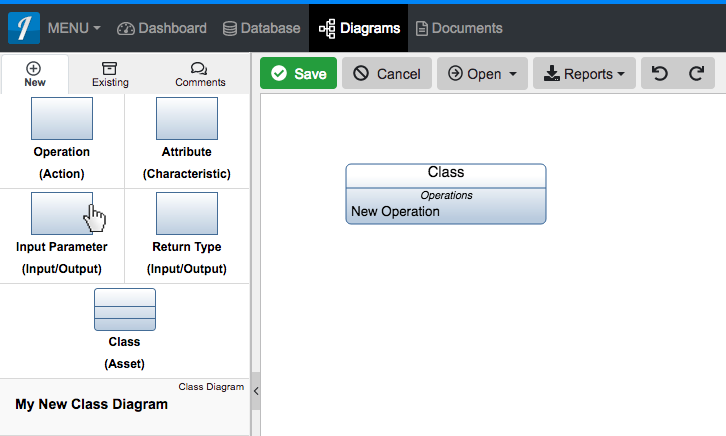 An 'Input Parameter' construct can be added to a 'Class Diagram' via drag-and-drop. An 'Operation' must first be added to a 'Class' in the diagram before this construct can be added. 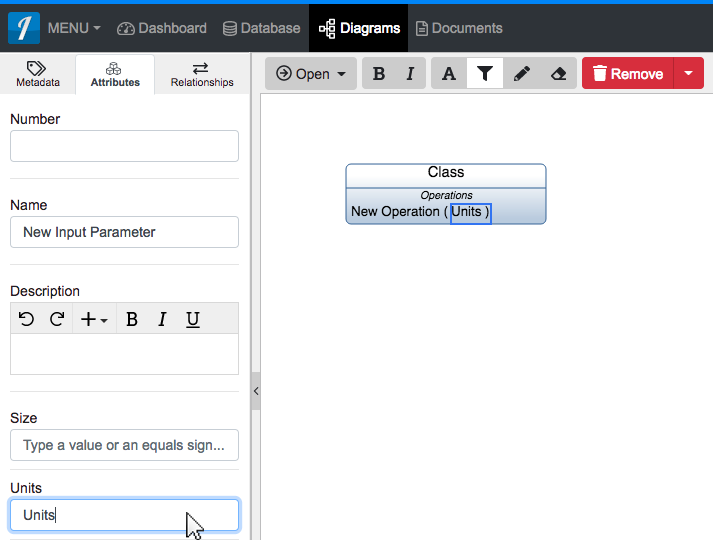 Within a 'Class Diagram,' click the 'Input Parameter (Input/Output)' icon in the 'New' tab of the left sidebar and continue to hold down the left mouse button. Drag the 'Input Parameter (Input/Output)' icon over to the bottom section of the 'Class' of the destination 'Operation' of your choice. Once added to the diagram, you can specify the unit(s) for your 'Input Parameter' under the ‘Attributes’ tab of the left sidebar. For more information on this construct and how it is represented in the database model, see Class Diagram Constructs. 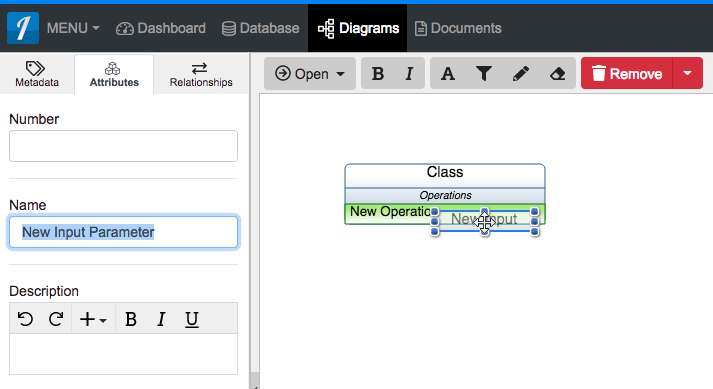 An ‘Input Parameter’ construct can be added to a ‘Class Diagram‘ via drag-and-drop. An ‘Operation‘ must first be added to a ‘Class‘ in the diagram before this construct can be added. 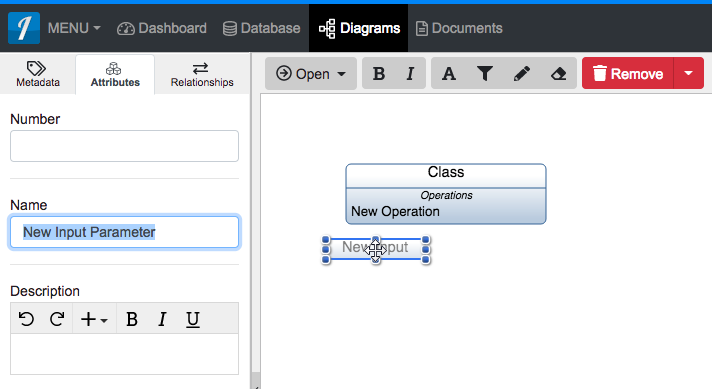 Within a ‘Class Diagram,’ click the ‘Input Parameter (Input/Output)’ icon in the ‘New’ tab of the left sidebar and continue to hold down the left mouse button. Drag the ‘Input Parameter (Input/Output)’ icon over to the bottom section of the ‘Class’ of the destination ‘Operation’ of your choice. Once added to the diagram, you can specify the unit(s) for your ‘Input Parameter’ under the ‘Attributes’ tab of the left sidebar.